Most groceries stores carry so many varieties of produce it is easy to forget that this was not always so. If I think hard, I can recall many new-to-me fruits and vegetables which have made their way to my home. Some were embraced and loved, while others never tasted again. When Clementines became the new fruit to try, the little orange globes were instantly popular, but they had issues like flavor-quality problems, were hard to peel, had a lot of seeds and they were only available for two or three months. Because Clementines were viewed to be a very profitable crop, growers ramped up their efforts to perfect this wonderful fruit. And they did! Today, most Clementines are unfailingly sweet, seedless and easy to peel. Even more wonderful, the original two or three month supply-window has somehow been extended and this lovely member of the citrus family is available almost year-round. Romaine-Clementine Salad is a refreshing dish. 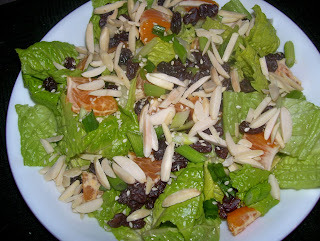 It has interesting flavors and textures and makes a colorful presentation.The light, oriental-style dressing brings out the fruit flavors and the toasted almonds provide a wonderful, satisfying crunch. Combine salad ingredients in a large bowl. Add dressing and toss lightly. Divide salad among 4 serving plates. Sprinkle with sesame seeds. Serve immediately. 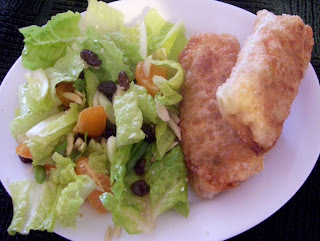 *To toast almonds, place desired amount in a small microwave-safe dish. Cook on HIGH for 30 seconds. Stir and continue process until lightly browned. Toasting the almond slices, while optional, adds a wonderful taste experience to this dish).